CrossFit and I finally met, and we became fast friends. CrossFit for me has been like the boy in high school who you steal glances at for a year before working up the courage to talk to him. This was the week I finally tried it. No more side glances. I went all in. ​I was invited to try a class by the daughter of one of my boot campers. I’d recently become friends with her, and one day at the pool she asked me if I liked squats. (This is how women who love to lift heavy start conversations. It actually seemed perfectly normal.) When I said no, she looked pretty shocked. I confessed that upper body work is my favorite, and that squats are hard for me because of my old knee injuries. But I told her that I’d always wanted to try CrossFit, so I was all in, even if squats weren’t on the menu that day. But then she walked away and I started to sweat. Even in the pool. Why? Because here’s my dirty little secret: I hate doing things that I’m not good at. Can’t say I’m proud of this trait, and it’s something I’m working on. I was nervous as could be yesterday morning, and probably went to the bathroom 5 times before Paige and I left for the gym. (Hooray for childcare at the gym!) My friend had texted me the night before, offering to send me the workout (aka WOD as they say in CrossFit) so I could see it in advance, but I was afraid I’d psych myself out if I saw it, and felt it was better to be surprised. I was crossing my fingers (and my ankles) that there wouldn’t be any double-unders on the list, and thankfully there weren’t. Healing my diastasis (abdominal separation as a result of pregnancy) has been on my to do list, but I haven’t gotten there yet. Hence the fear of the jump rope. As the group filed in, I met each of the regulars. They seemed like a friendly bunch, and the group was made up of mostly fellow moms. I was still nervous, but was feeling more at home. The class began with something I had just seen somewhere on my social media feed somewhere: high plank side shuffles with hand taps on a row of kettlebells, and then air squats at each end. Got it. So far, so good. Next up in the warm up: walking lunges and handstand push ups. Walking lunges? No problaymo. Handstand pushups? Um, ok–here we go. I tucked in my shirt and actually managed to do a few sets, and not completely embarrass myself. I tried the split jerk again. “Close!” he said kindly, but looked a little befuddled as he watched me try to connect the movements together. “Hmm,” he said. “How about if you just stick with the push press today?” YES, PHEW. I’ll take it. So my friend and I are paired together at one of the bar racks and she’s loading on the plates for her lift. And loading. And loading. My jaw drops. Holy moly moly is this woman strong. 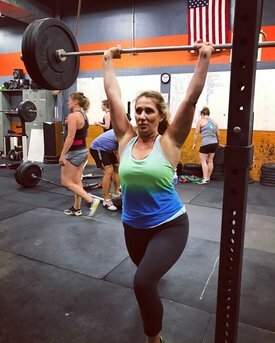 Keep in mind, pressing the bar over your head is a really hard exercise, especially for women, at least as I’ve seen in my experience. But she made it look so effortless, even with the motherlode of weight on the bar. But I knew I couldn’t lift as much as her, and needed to use less weight on the bar for my lifts. I was having a hard time accepting this. I felt exposed. Could I still call myself a trainer if I can’t keep up? My heart started to pound, and I had to shake off the negativity before I began to spiral. It was all of my own doing. The group and coaches were very encouraging and supportive, and the negativity was all in my head. In that moment, I was my own worst enemy. I don’t know why I couldn’t accept that this was my first class, and that I couldn’t expect myself to be a rockstar on my first go. But that was my rational side. I had to let that voice be louder than the one tearing me down. So I picked up my head and kept at it, and watched in awe as my friend knocked out set after set. Amazing. And then mercifully, relief came in the form of one of my favorite things: a short run. YAHOO! MY COMFORT ZONE! 800 meters, down the street and back. I ran like my pants were on fire. It felt so good. But no rest for the weary. After the run came this beastly finisher: four rounds of 7 snatches/arm with a 35lb dumbbell (I used 25 instead) followed by 14 burpees. FOUR ROUNDS. And then the reward for finishing that was 10 lengths of the gym doing farmer’s carries with kettlebells. Really heavy ones. But then guess what? I was DONE! HOLY MOLY MOLY MOLY. THAT WAS STINKING HARD. So what did I learn in this experience? That I still have a lot of work to do in not beating myself up when I’m trying new things. Quell the voices and enjoy the new experience. And that some of the moms in this town are INSANELY strong. My hat’s off to these women: they work hard and never let up. Inspiring? You better believe it. Will I do it again? Perhaps. You’ll have to stay tuned to find out. In case you’re curious, here’s the WOD that we did: CrossFit Carrboro WOD.